Mayor Crombie addresses small business owners in attendance during the Mayor’s Small Business Forum. 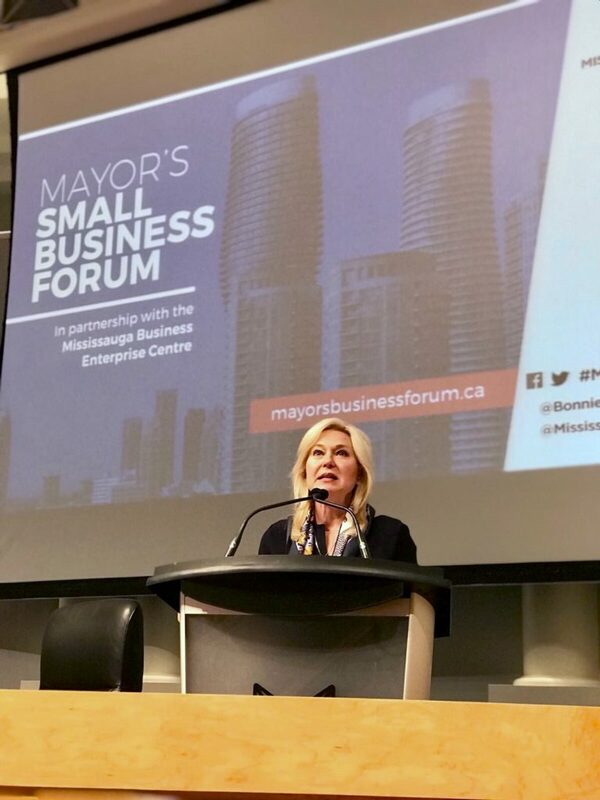 In Mississauga, we mean business when it comes to supporting thought leaders, start-ups and small and medium-sized enterprises to develop concepts, secure capital investments and launch their next big ideas into the marketplace, Mayor Bonnie Crombie said Wednesday during the Mayor’s Small Business Forum, where over 300 people were in attendance at City Hall. This inaugural event, hosted by Mayor Crombie in partnership with the Mississauga Business Enterprise Centre, coincided with Small Business Month and Small Business Week which both take place in October. Susan Amring, Director of Economic Development and David Wojcik, President and CEO of The Mississauga Board of Trade, were both on hand and delivered speeches about local resources, programs and networking opportunities available to small business owners. Mayor Crombie also highlighted other city-building initiatives that will help small businesses better compete, namely breaking gridlock and building regionally-integrated public transit. Mayor Crombie added “We have more planned to help small businesses reach higher. As part of our ongoing efforts to help small businesses and start-up companies we launched First Look – an annual event that brings together entrepreneurs and angel investors looking for their next big opportunity. “It was at First Look – where experts from GreenSky Capital – got their first look – at AOMS Technologies. First Look put AOMS on course to secure an investment of $925,000 in financing from GreenSky Capital. This funding is enabling the company to expand its sales and marketing efforts and improve product development. “Join us on Wednesday, November 22, for the next Mayor’s Youth Speaker Series featuring Dr. Patrick Gunning.” Dr. Gunning is a world-class researcher, scientist and entrepreneur who also serves as Canada Research Chair in Medical Chemistry Professor, Department of Chemical & Physical Sciences University of Toronto Mississauga (UTM). The event will take place from 7-9PM at UTM’s Instructional Centre Building. Space is limited and registration is mandatory at www.youthspeakerseries.ca.